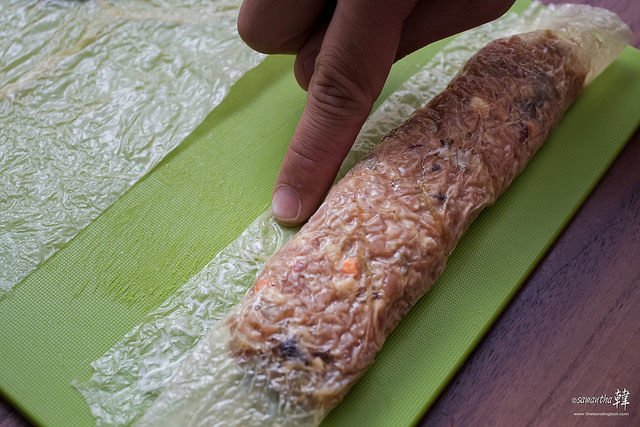 Ngoh Hiang (五香滷肉卷) is 5-spiced pork rolls wrapped with translucent beancurd skin, a sheet different from those for making gingko barley dessert soup. 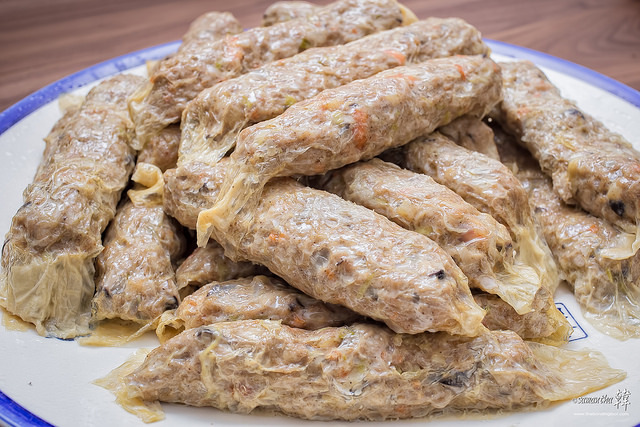 Ngoh Hiang is great as an entrée or appetiser as well as a potluck dish for parties! 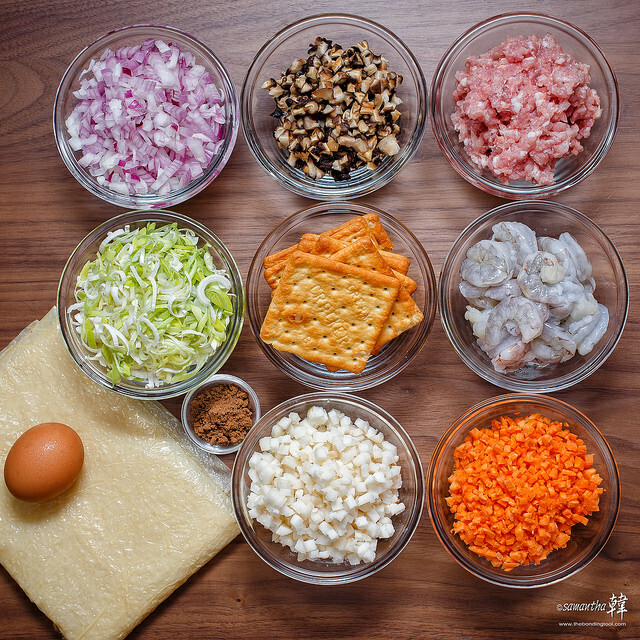 Ngoh Hiang is a traditional must-have item at almost every Chinese New Year celebrating households and each family have their versions to the recipe. You can substitute pork with chicken and if you must omit the meat completely (eyes rolling), go for spring rolls instead! Some of the ingredients for Ngoh Hiang from left clockwise and leading to centre: Spanish (red) Onions, Mushrooms (reconstituted), Minced Pork (my mom stressed on front leg so I use front leg always), Shrimp?Prawn Meat, Carrots, Water Chestnuts, 5-Spice Powder (looks like cocoa), Beancurd Skin for Ngoh Hiang, Egg, Chinese Leek (大蒜 garlic family), Cream Crackers (centre of image) to act as fillers not unlike Panko or bread crumbs, and perhaps some flavour enhancement as I use Hup Seng which has some buttery taste. I am surprised just as my readers are surprised about the use of cream crackers in my recipe. The cream crackers can be substituted with plain flour or perhaps it was the other way round? Anyway, cream crackers have been used in my family for generations. I might create my very own legacy using Nestum cereal next time. Eh, I “chope” this idea first hor! 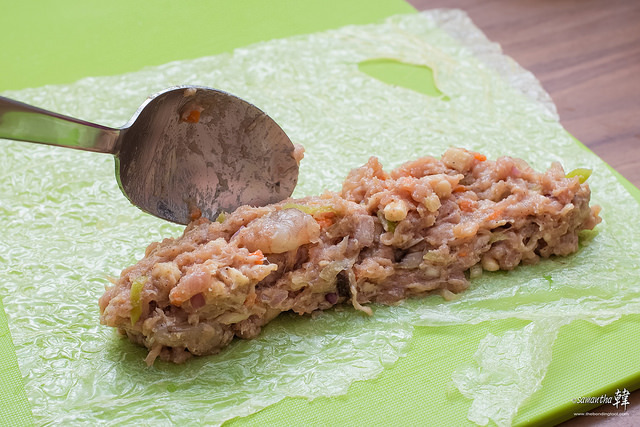 By the way, the seasoned meat filling is best left overnight in the fridge if possible, otherwise at least a couple hours. I sometimes let it sit in the fridge for 2 days if I’m super busy. Note: While you can fry the rolls immediately after wrapping, I prefer to steam-cooked them first as I usually make a huge batch. Steamed rolls can be kept (in portions) in sealed plastic bags in the freezer for months (I’ve tried 6 months in good freezers). I take a pack out of the freezer and defrost it in the chiller/fridge overnight or two days in advance (my chiller is maintained at zero degree) for our own family dinner or a small gathering with friends. Okay! Without further adieu, here’s my family’s version of Ngoh Hiang. 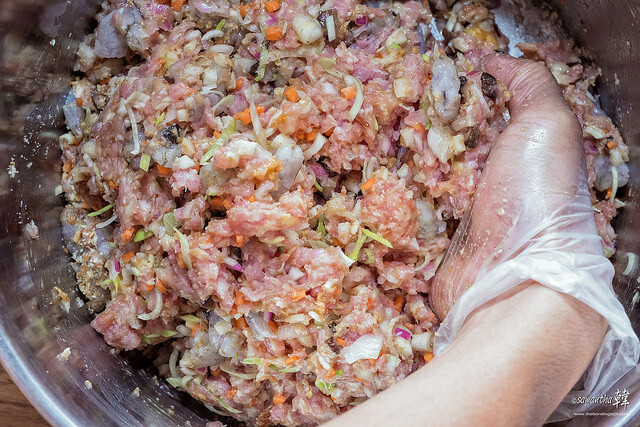 1.5kg minced Pork (preferably with some fats. I used front leg meat, 前腿肉). 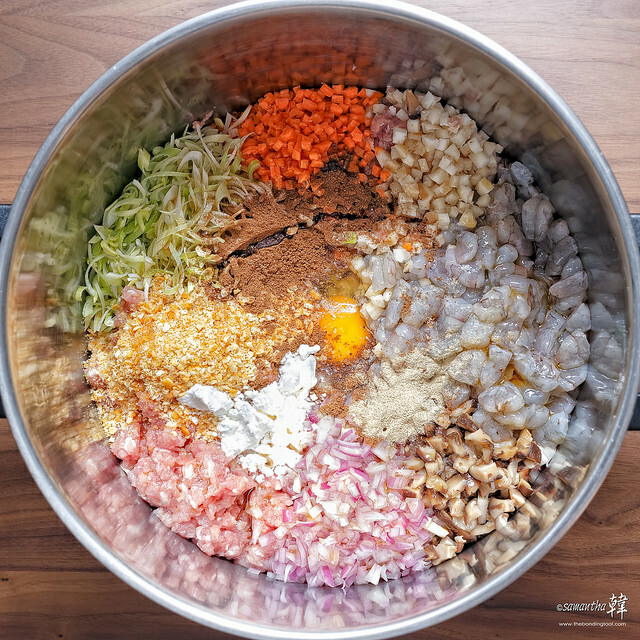 750g small – medium sized Prawns, shelled, deveined and cut into small chunks (see photo). 500g Spanish Onions, peeled and diced (about 5-6 large onions). 500g Water Chestnut, peeled and diced (about 18-20 pieces). 2-3 stalks Chinese Leek, sliced thinly. 1 small Carrot, peeled and diced. 10 caps Dried Shitake Mushrooms (reconstituted in a bit of hot water – when plumped, wash the underside of caps to remove spores, squeeze dry and diced – strain soaking mushroom water and put back the mushrooms and simmer till as much water is absorbed back into the mushrooms so as not to lose its flavour). 15 pieces Cream Crackers, pulsed in food processor into crumbs. 10g 5-Spice Powder (use lesser if the spices smell to strong). 2-3 tablespoons Light Soy Sauce. 2 tablespoons White Granulated Sugar. 1 tablespoon White Pepper Powder. 1-2 tablespoon White Sesame Oil. 2 pieces of Ngoh Hiang Beancurd sheet, fold lengthwise 2x, yielding 4 long strips each sheet (6-8 in total). 1. Seasonings should always start from lesser amount and build on it. 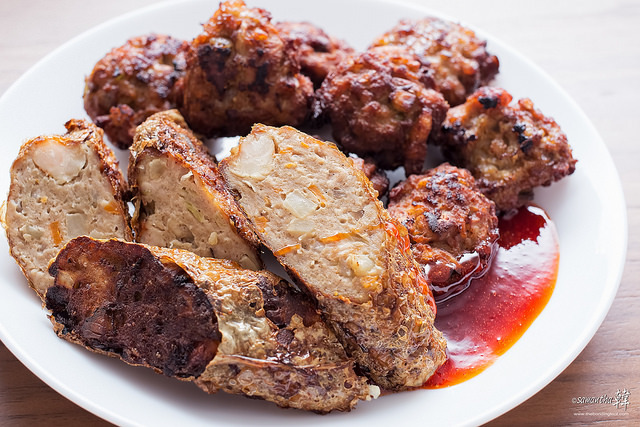 You can cook some of the marinated meat and test-taste them to determine if you should add more according to you/your family’s desire. There’s no oyster sauce in my grandma’s days so this seasoning was my idea and I think it worked well. Nana used salt and light soy in her recipe. 2. 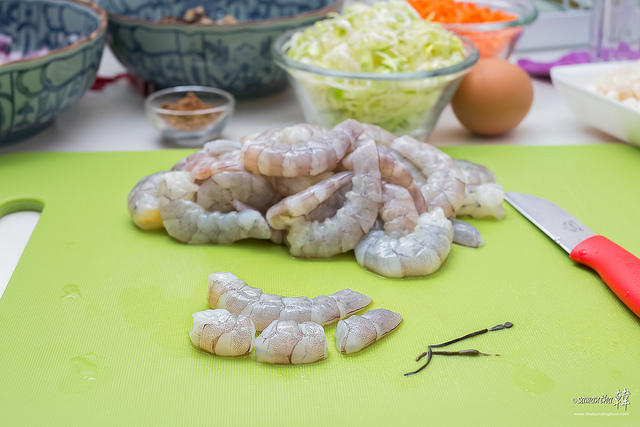 Always save unused prawn shells in a plastic bag and freeze them for other dishes like fried Hokkien mee, prawn noodle soup, laksa lemak. Use small to medium sized Prawns as it is a waste to spend a fortune on big prawns for this dish. Besides, small prawns are more sweet and lively in texture, at least to me. Remove shells, devein and cut them into small chunks. Always save unused prawn shells in a plastic bag and freeze them for other dishes like fried Hokkien mee, prawn noodle soup, laksa lemak. Place all the ingredients and seasonings (except for the beancurd sheet) in a deep pot. 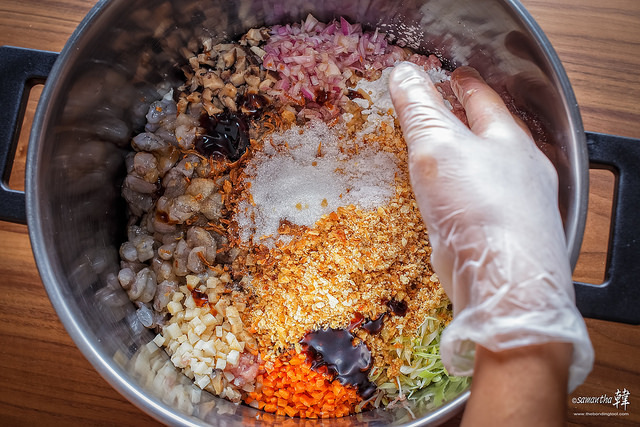 Use your hand like it were a cake mixer, stir in one direction until all the ingredients are thoroughly mixed and feels “gluey” (起胶). There’s no need to slap the meat around, we are not making fish balls. You may if you want very compressed texture to the meat but I prefer “loose” mince as I find it more flavoursome during mastication and the uneven look more “authentic” of home-made/hand-made rolls. 1. Place all the ingredients and seasonings (except for the beancurd sheet) in a deep pot. 2. Stir in one direction until all the ingredients are thoroughly mixed. Do a taste test and adjust seasonings if necessary. 3. Cover pot (lid or cling-wrapped) and leave seasoned meat in fridge overnight or for at least a couple hours before you fry the rolls. Brush some oil onto the steaming racks if you intend to steam-cook the Ngoh Hiang like me. Otherwise, skip this step and proceed to wrapping. Fold Beancurd Sheet (Ngoh Hiang Skin) lengthwise into half and then half again, yielding 4 long strips for each sheet. 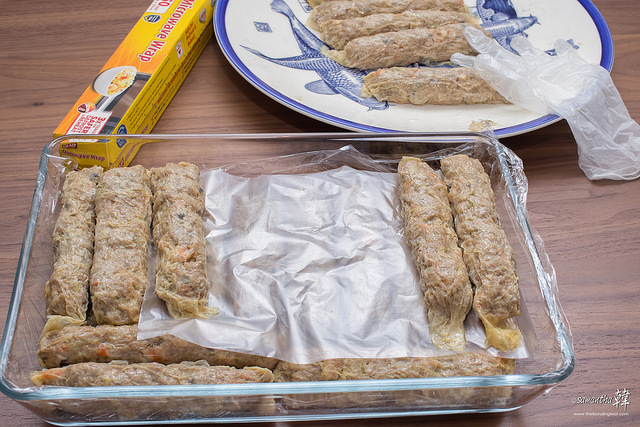 I had 2 sheets (one on standby) but in the end used 1½ sheet only, with a bit of the meat filling left. Put a few spoonfuls of seasoned meat onto the beancurd sheet leaving about half an inch empty on both ends. 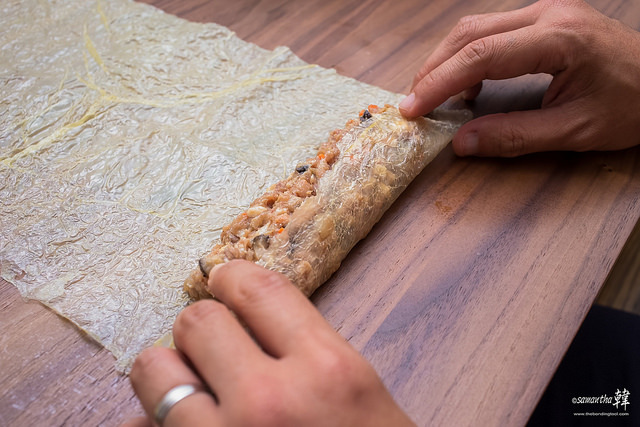 Wrap up the Ngoh Hiang like swiss roll until the skin makes a complete round. 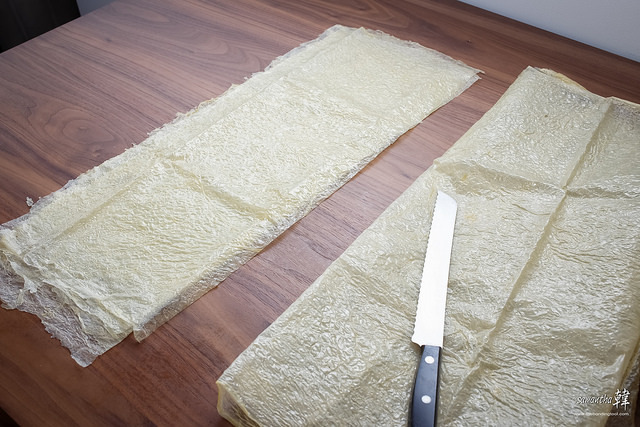 Cut the sheet/skin lengthwise with a knife leaving about half a centimetre. Seal the skin with some cornflour solution. Cornflour solution ratio is 1 cornflour to 2 water. Repeat until all the meat filling is used up. If you do not intend to steam skip to step 7 in “Method”. Steam for about 25-30 minutes on medium high heat. Make sure there’s enough water to steam for the whole duration or gently pour more hot water along the sides of the lowest steamer of the pot without touching the rolls. 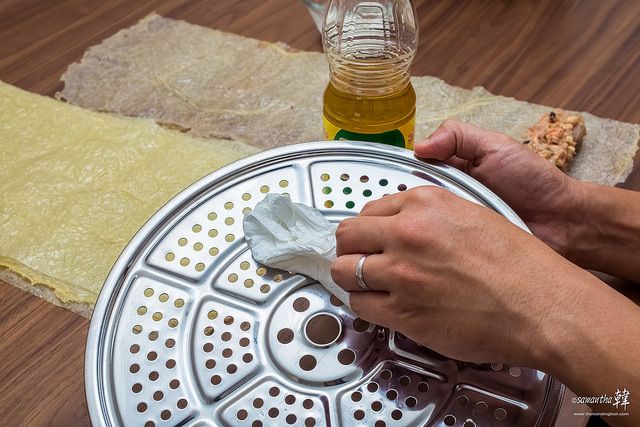 Brush some oil onto the rolls whilst hot and then gently transfer them onto a platter to cool off completely before packaging them for chilling/freezing until required. You may also fry them in oil till the skin is crispy if eating immediately. 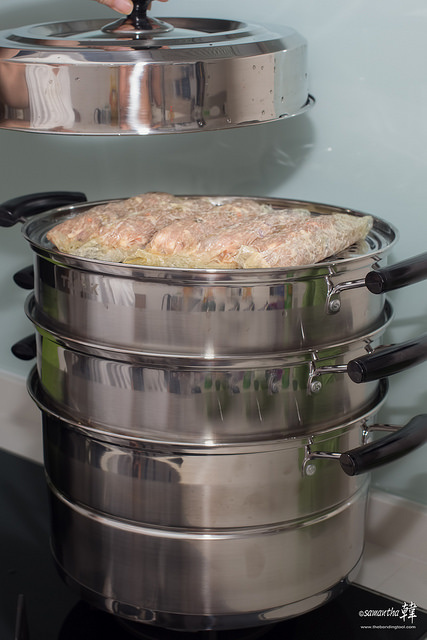 Steam-cooking helps with storage life since meat is fully cooked. 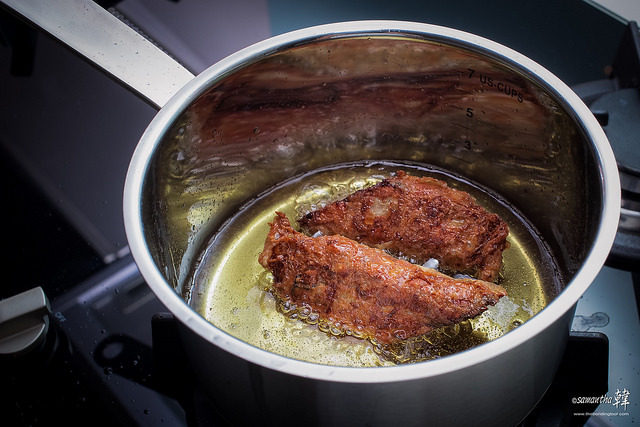 Steaming is not necessary if you are cooking and eating them within the same day. I do it because 1) my predecessors did it 2) I usually prepare Ngoh Hiang many days in advance, and this frees me up to do other chores for the Lunar New Year. If you intend to freeze some for future use, let the rolls cool completely before portioning and freezing. 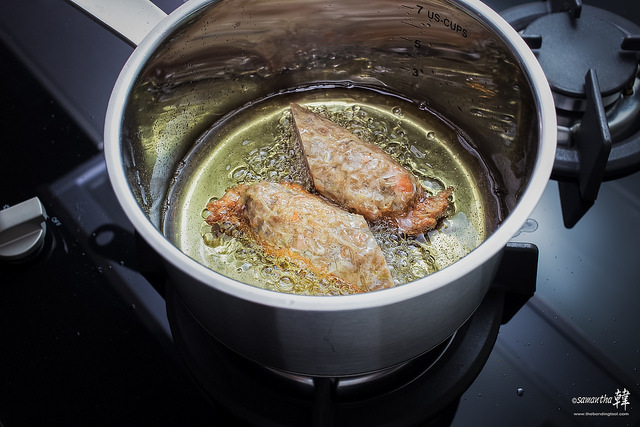 In a heated wok/pot (deep-fryer), pour oil and maintain heat at medium high about 160°C. To maintain heat, do not overcrowd the wok/pot/deep-fryer with too many rolls at one go. Cook in batches. Of course, I fry more than two at one time but this was for taste-testing and blog post demonstration purpose only since I am keeping the whole batch for Reunion and CNY dinners. Bring up the heat to about 180°C to 200°C (wok may be smoking so be very carefully when frying not to burn the rolls) and fry until they are golden brown. I still had some meat filling but no more skin so I made them into meat balls. TJ loves them! 1. Brush some oil onto the steaming racks if you intend to steam-cook the Ngoh Hiang like me. Otherwise, skip this and proceed to step 2. 2. Fold Beancurd Sheet (Ngoh Hiang Sheet/Skin) lengthwise into half and then half again, yielding 4 long strips. 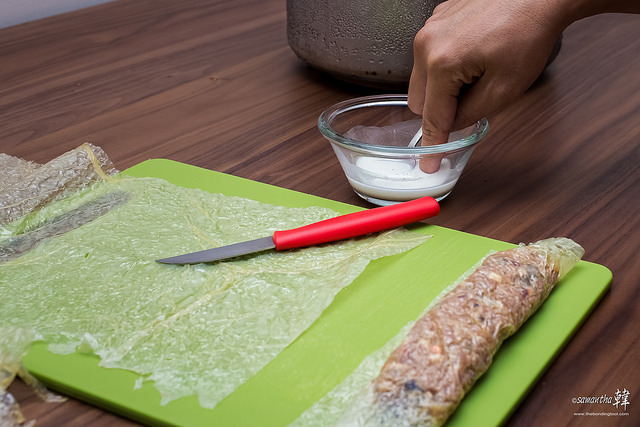 Wipe the surface of the beancurd skin with a very slightly damp kitchen towel to remove the salt bits and to keep the skin pliable but it was not necessary for these sheets I bought. One less step of work for me. 3. Bring the pot of chilled seasoned meat out to near room temperature before you start wrapping them. 4. Put a few spoonfuls of seasoned meat onto the beancurd sheet leaving about half an inch empty on both ends. 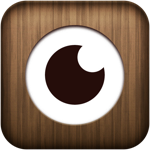 *If you do not intend to steam skip to step 7. 6. Carefully place all the rolls preferably in a single layer onto the greased steaming racks. I had plenty of rolls even though my steamer is 4-tiered, I needed to pile some in 2 layers per rack. Leave some gap in between the rolls for expansion during steaming. Steam for about 25 – 30 minutes on medium high heat (as long as the water is rolling, not overly strong heat, as the skin might expand too much and separate from meat filling, making them extra wrinkly when cooled or worse, busted the skin. *If you intend to freeze some for future use, let the rolls cool completely before portioning and freezing. 7. 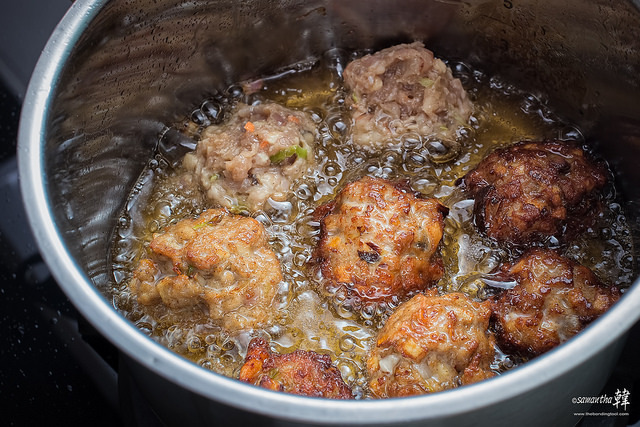 In a heated wok/pot (deep-fryer), pour oil and maintain heat at medium high about 160°C (you will see oil bubbles if you stick a wooden chopstick into the oil). Swirl oil around the wok/pot to keep it well lubricated. 8. Gently slide each roll of Ngoh Hiang into the wok of medium hot oil and fry until they are light golden on all sides. 9. Bring up the heat to about 180°C to 200°C (wok may be smoking so be very carefully when frying not to burn the rolls) and fry until they are golden brown. 10. Line a baking tray or platter with oil-absorbent paper kitchen towels. Remove cooked Ngoh Hiang from fryer with a perforated ladle or chopsticks if you’re fast enough and put them onto the lined tray/platter to drain off excess oil. 11. When cool enough to handle, cut them diagonally into thick slices. Arrange the pieces on a plate garnished with sliced cucumbers, tomatoes and Chinese lettuce if you desire. 12. Serve hot, warm or even at room temperature with chili sauce and sweet flour sauce. When cool enough to handle, cut them diagonally into thick slices. Arrange the pieces on a plate garnished with sliced cucumbers, tomatoes and Chinese lettuce if you desire. As this was for taste testing, I did not have the garnishing ingredients and have not bought the sweet flour sauce. I will be doing the pre-reunion late night shopping and get those on that night. Hi Kelly, I bought them from the wet market but I think Sheng Shiong also sells the one without salt.